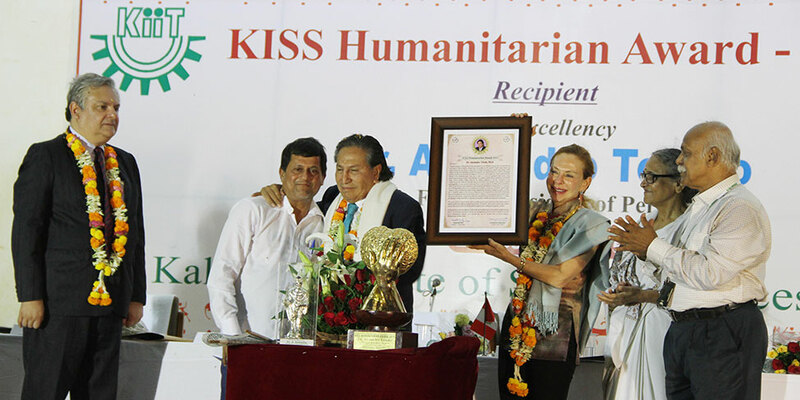 The prestigious KISS Humanitarian Award 2015 was presented to His Excellency Dr. Alejandro Toledo, Former President of Peru at Kalinga Institute of Social Sciences (KISS), Bhubaneswar on October 22, 2015. Dr. Alejandro Toledo, Former President of Peru receiving a memento and a tribal painting from Dr. A. Samanta, Founder, KIIT & KISS and Smt. Saswati Bal, President, KIIT & KISS in the presence of Shri R. N. Dash, Secretary, KIIT & KISS. Dr. Alejandro Toledo, Former President of Peru and Madam Eliane Karp-Toledo after receiving the KISS Humanitarian Award 2015 from Dr. A. Samanta, Founder, KIIT & KISS in the presence of Smt. Saswati Bal, President, KIIT & KISS, His Excellency Mr. J. J. Guillermo Betancourt Rivera, Ambassador of Peru to India and Shri R. N. Dash, Secretary, KIIT & KISS. 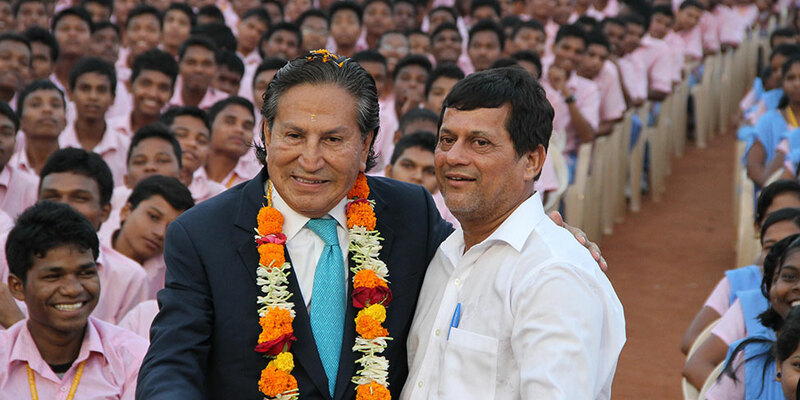 Dr. Alejandro Toledo, Former President of Peru with tribal students of KISS. 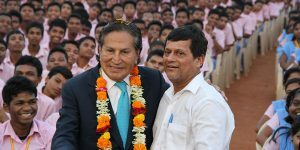 Dr. Alejandro Toledo, Former President of Peru with Dr. A. Samanta, Founder, KIIT & KISS and 25,000 tribal students of KISS. His Excellency Dr. Alejandro Toledo, Former President of Peru speaking on the occasion. 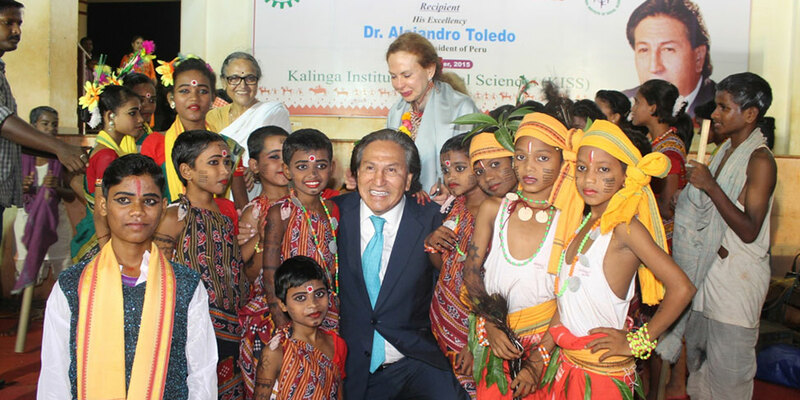 The prestigious KISS Humanitarian Award 2015 was presented to His Excellency Dr. Alejandro Toledo, Former President of Peru at Kalinga Institute of Social Sciences (KISS), Bhubaneswar on October 22, 2015. Smt. Saswati Bal, President, KIIT & KISS and Dr. Achyuta Samanta, Founder presented the award in the august presence of Madam Eliane Karp-Toledo, His Excellency Mr. J. J. Guillermo Betancourt Rivera, Ambassador of Peru to India, Mr. Carlos Jimenez Gil-Fortoul, Deputy Chief of Mission, Embassy of Peru in India and Shri R. N. Dash, Secretary, KIIT & KISS. 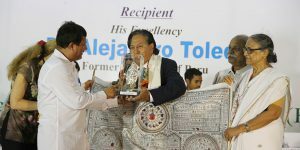 The award citation recognized him as an “icon of hope and aspirations of millions of poverty stricken and indigenous aborigine people around the world.” Dr. Toledo was the first South American President of indigenous descent to be democratically elected when he became President of Peru in 2001. During his five-year term, his central aim was the fight against poverty through investment in healthcare and education. As a result of social policies directed to the poorest of the poor, extreme poverty was reduced by 25 per cent in five years, and employment rose at an average rate of 6 per cent during his term. He grew up in extreme poverty in a family of sixteen siblings. However, he worked his way up against all odds, obtained higher education from top universities of the U.S. and went on to be elected the President of Peru. Education is the most effective weapon to slay poverty and inequality, Dr. Toledo said in his acceptance address. Speaking to 25,000 tribal boys and girls of KISS, he said, “I invite you to dream in order to be successful, but dream with your eyes open. Don’t get truncated by the impossibility of your dreams. We have a lot of things in common”. “Dr. Samanta is changing the lives of millions of people. We give you tribute. I was born in a poor family in the high mountains of Andes of Peru. I grew up in extreme poverty – 7 out of 16 of my siblings died within the first year of birth. They died as they didn’t have access to health care, nutrition and sanitation, and the visionary Dr. Samanta. We didn’t have Dr. Samanta in my country and my continent”, the Former President of Peru stated. Recounting the story of his life he said, his father decided to migrate from the mountains to the sea port when he was 4.5 years old. “I am of short height due to malnourishment, but I could save my mind. A shoe shining boy, newspaper seller to supplement the daily income, I come from where you come from. The challenge is same, even though the language and religion are different. You have the luck of being at KISS”, he told the students. It is an emotional and happy experience to be amongst 25,000 indigenous children, said Madam Toledo, adding that it is a great learning as Peru also has a sizeable indigenous population. Speaking on the occasion, Mr. Rivera stated, Dr. Toledo’s life gives the message that one can achieve any success by studying hard and being gentle to others. This award is recognition to an extraordinary life who is committed to work for the poorest for the poor, he added. In her presidential address, Smt. 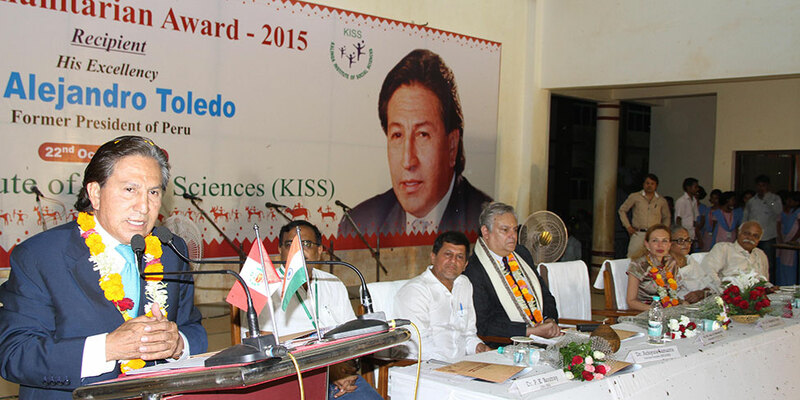 Bal said, presenting KISS Humanitarian Award 2015 to Dr. Toledo was a great honour for the institute. His words will be a source of great inspiration for the students of the institute, she added. Welcoming the former President of Peru and the visiting dignitaries, Dr. Samanta said, the recipient is a beacon of light to the aborigines of South America and his concern for the common man and indigenous people is well known all over the world. The KISS Humanitarian Award was instituted by Kalinga Institute of Social Sciences (KISS), Bhubaneswar in 2008 to honour and recognize individuals with exceptionally high contribution to the society in various fields relating to social issues and who have distinguished themselves as true humanitarians. The award is presented annually and its recipient is chosen by a high-level jury. KISS Humanitarian Award is being presented every year since its inception to great compassionate leaders of vision and concern for human values from different parts of the world. 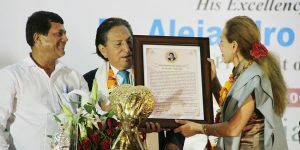 Dr. Alejandro Toledo is the eighth KISS Humanitarian Laureate. Previous recipients of this prestigious award are: Ms. Anne F. Stenhammer, Former Regional Programme Director, UN Women, South Asia Regional Office (2014); Madam Albina Du Boisrouvray, Founder, FXB International, Switzerland (2013); His Excellency Lyonchhen Jigmi Y. Thinley, Hon’ble Prime Minister, The Royal Government of Bhutan (2012); Rt. Hon. Lord Nicholas Addison Phillips, President (Chief Justice) of the Supreme Court of the United Kingdom (2011); Rt. Hon. Sir Anerood Jugnauth, Eminent Social Worker & His Excellency the President of Mauritius (2010); Dr. Ham Kee-Sun, Eminent Educationist & Physician and Hon’ble President & Founder, Hanseo University, South Korea (2009); Ms. Edna Bomo Molewa, Noted Social Worker & Hon’ble Cabinet Minister, Social Development, South Africa National Assembly, South Africa (2008). Shri R. N. Dash, Secretary, KIIT & KISS also spoke on the occasion, while Dr. P. K. Routray, CEO, KISS proposed the vote of thanks. Dr. Alejandro Toledo was democratically elected President of Peru in 2001. During his five-year term, the central aim of Toledo’s presidency was the fight against poverty through investment in healthcare and education. As a result of sustained economic growth and deliberate social policies directed to the poorest of the poor, extreme poverty was reduced by 25 per cent in five years, and employment rose at an average rate of 6 per cent from 2004-2006. From 2001-2006, the Peruvian economy grew at an average rate of 6-7.5% per cent, making it one of the fastest growing economies in Latin America. Before becoming president, Dr. Toledo worked for the World Bank and the Inter- American Development Bank in Washington, D.C., and the United Nations in New York. He first appeared on the international political scene in 1996 when he formed and led a broad democratic coalition that eventually brought down in 2000 the autocratic regime of Alberto Fujimori. Toledo was born in a small and remote village in the Peruvian Andes, 12,000 feet above sea level. He grew up in extreme poverty in a family of sixteen siblings. His family migrated from the high lands to a sea Port in the coast. At the age of six, Toledo worked as a street shoe shiner and also sold newspapers and lottery tickets to supplement the family income. Thanks to a series of accidental opportunities, which included the decisive help of two Peace Corps Volunteers, he was able to escape from extreme poverty and attend the most prestigious academic centers of the world. Later he becoming one of the most prominent democratic leaders of Latin America and now globally. Dr. Toledo is the first South American President of indigenous descent to be democratically elected in five hundred years. Toledo received a BA in Economics and Business Administration from the University of San Francisco California. He has an MA in Economics, and an MA and Ph. D. in the Economics of Human Resources from the School Education, Stanford University. During his academic career, Dr. Toledo was a Visiting Scholar and Research Associate at Harvard University and a Research Associate at Waseda University in Tokyo. After finishing his term as President, Toledo returned to Stanford for three years, where he was a Distinguished Fellow in Residence at the University’s Center for Advanced Study in the Behavioral Sciences, and also a Payne Distinguished Visiting Lecturer at the Freeman Spogli Institute’s Center on Democracy, Development, and the Rule of Law. Simultaneously, Dr. Toledo founded and continues to serve as the President of the Global Center for Development and Democracy (www.cgdd.org), which is based in Latin America, the United States, and the European Union. In 2009-2010 Dr. Toledo was a Distinguished Visiting Scholar at the School of Advanced International Studies at Johns Hopkins University in Washington, D.C., and also a Non – Resident Senior Fellow in Foreign Policy and Global Economy and Development at the Brookings Institution in Washington DC. Dr. Toledo, in recent years has published on policy oriented academic issues related to Economic Growth, Inclusiveness and Democracy. Most recently he has led several Electoral Observation Missions with NDI and the Carter Center, in Nicaragua, Ecuador and Tunisia. Dr. Toledo has lectured in more than forty five countries on issues related to Economic Growth, Poverty and Inequality Reduction and Democracy, as well as on the Benefits of Human – Capital Investment. He has received 75 Honorary Doctoral Degrees from prestigious universities in Peru and around the world. Dr. Toledo serves in different Boards of Directors Foundations and Companies around the world. Dr. Toledo most recent books are “ECONOMIC GROWTH FOR SOCIAL INCLUSION: FIVE YEARS IN WHICH WE PLANTEED THE FUTURE, 2001- 2006. Published by Planeta Press, July2014, Peru, and “THE SHARED SOCIETY: A VISION FOR THE GLOBAL FUTURE OF LATIN AMERICA”, Published by Stanford University Press, March 2015.